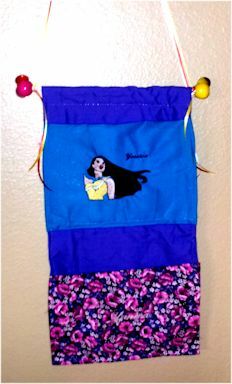 Custom wall or hook hanging pocket extenders and organizers for home, travel, car or cruises! Pockets are sized 6x4". If you need a different size, please inquire. Your choice of fabrics: solids, prints, plaids, dots or others that are available at the time of order. This includes the hanger (ribbons and wooden dowel) and pockets. Embroidery is extra, please make sure to add embroidery options to your order. Add the header, footer or both! Customize the top to say Cruising or Cruisin with Mickey or Minney. Other options can be an RV with a short phrase. Add upgraded embroidery to pockets, with Mickey, Minnie, Disney Princes, Frozen, Star Wars and more! These vary in size but usually between 2-3 inches. Add first names to your pockets or a title. 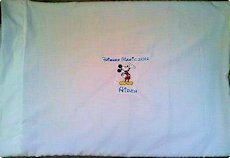 Special pillow cases to take on your Disney cruise to drop off to have autographed. Includes 1 character embroidery, ship name and year. Mickey, Minnie, Disney Princes, Frozen, Star Wars and more!